Bernadine Patricia Healy (August 4, 1944 – August 6, 2011) was an American physician, cardiologist, academic, and first female National Institutes of Health (NIH) Director. She was a professor of medicine at Johns Hopkins University, professor and dean of the College of Medicine and Public Health at the Ohio State University, and served as president of the American Red Cross and the American Heart Association. She was health editor and columnist for U.S. News & World Report. She was a well-known commentator in the media on health issues. For eight years she headed the coronary care unit at the Johns Hopkins Hospital. At the medical school she served as assistant dean for post-doctoral programs and faculty development. During that time she organized a nationally covered Mary Elizabeth Garrett symposium on women in medicine which examined the opportunities and hurdles faced by women physicians roughly 90 years after the founding of the medical school in 1893, and at the same time honored Ms. Garrett, the Victorian socialite and philanthropist who made sure Johns Hopkins School of Medicine opened its admissions to women (the medical school opened its doors on October, 1893; and three of the eighteen original candidates for the M.D. degree were women) and ultimately admitted women and men precisely on the same terms. Dr. Healy served from 1991 until June 30, 1993. Healy was the first woman director at NIH. As president of the American Heart Association from 1988 to 1989, she sought to convince both the public and medical community that heart disease is also a woman's disease, "not a man's disease in disguise". Appointed president of the American Red Cross in 1999, Healy worked to improve the safety and availability of the American blood supply while overseeing the development of a Weapons of Mass Destruction response program. In 2001 she led the organization’s response to the September 11 attacks. 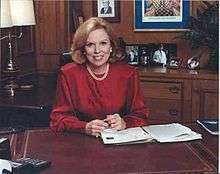 In 1985 Healy left Washington and moved to Cleveland where she became Chairman of the Cleveland Clinic Research Institute and also practiced cardiology. In addition to building major new programs in molecular biology, neuroscience, and cancer biology, she headed a large NIH-funded research program in hypertension, and was the lead investigator for the Cleveland Clinic's participation in a major clinical research study comparing angioplasty with coronary artery bypass surgery. She headed the NIH advisory board for another multi-center clinical study that showed statins could slow course of atherosclerosis in coronary artery bypass grafts. During this time she initiated a medical student program in alliance with Ohio State University that served as a precursor to the founding of the Cleveland Clinic College of Medicine in 2004. Healy served on numerous medical advisory committees and boards over her career. They included committees of the National Academy of Science's Institute of Medicine, of which she is a member, and the national Academy of Engineering; the Department of Energy, NASA, and the National Institutes of Health. She participated briefly on an Advisory board of The Advancement of Sound Science Coalition (an organization later shown to have been funded by Philip Morris), and served on numerous advisory groups and Boards of the American Heart Association and the American College of Cardiology, where she was an outspoken critic of smoking and its effects on the cardiovascular system. Healy was married to cardiac surgeon Floyd D. Loop, a former CEO of the Cleveland Clinic. She and her husband had one daughter, Marie McGrath Loop. She had another daughter, Bartlett Bulkley, from her previous marriage. ↑ Google search (cache version) re Healy's brain cancer battle Archived September 30, 2009, at the Wayback Machine. ↑ Olmsted, Dan (December 26, 2008). "Age of Autism Awards 2008 Person of the Year: Dr. Bernadine Healy". Age of Autism. Retrieved October 19, 2009. ↑ Doja A, Roberts W (2006). "Immunizations and autism: a review of the literature". Can J Neurol Sci. 33 (4): 341–6. doi:10.1017/s031716710000528x. PMID 17168158. ↑ Godlee F, Smith J, Marcovitch H (2011). "Wakefield's article linking MMR vaccine and autism was fraudulent". BMJ. 342:c7452: c7452. doi:10.1136/bmj.c7452. PMID 21209060. ↑ Sontag, Deborah (December 23, 2001). "Who Brought Bernadine Healy Down?". New York Times. Retrieved April 5, 2009. ↑ "The Battle Inside The Red Cross: Internal Power Struggle Came To A Head After Sept. 11". CBS. July 31, 2002. Retrieved April 5, 2009. ↑ "The American Red Cross: They took your blood and your money. Now it's payback time.". slate.com. November 9, 2001. Retrieved April 5, 2009. ↑ "American Red Cross President Dr. Bernadine Healy Announces Decision to Step Down". CNN. October 26, 2001. Retrieved April 5, 2009. ↑ "Former NIH Director Healy Dies at 67". National Institutes of Health. NIH Record. September 2, 2011. Retrieved 28 June 2016. ↑ "Tobacco Industry Efforts Subverting the International Agency for Research on Cancer's Secondhand Smoke Study". Tobaccodocuments.org. September 11, 2002. Retrieved October 19, 2009. ↑ "Don't Be Scared to Circumcise Your Baby Boy – US News and World Report". Health.usnews.com. December 6, 2007. Retrieved October 19, 2009. ↑ "Leading Dr.: Vaccines-Autism Worth Study". www.cbsnews.com. Retrieved 2016-03-05. ↑ Feran, Tom (June 12, 2015). "Dr. Floyd Loop, heart surgeon who led Cleveland Clinic to preeminence, has died". Cleveland Plain Dealer. Retrieved March 5, 2016. ↑ Robert D. McFadden (August 8, 2011). "Bernadine P. Healy, a Pioneer at National Institutes of Health, Dies at 67". The New York Times.